Extremely shocking and very saddening! Such is the reaction of every Byzantinist today after the results were released yesterday by a group of volunteers, called the Archaeological Settlements of Turkey Project, or TAY Project. The Byzantine period buildings of the Marmara region themselves were reviewed over a period of 88 days in 2008 and covered 427 buildings. The results - 377 buildings are subject to destruction primarily due to unplanned urbanization among many other preventable reasons. -Balkaya Church 1 reveals that three cavern churches of Byzantine times are now used as goat shelters, and the crosses are destroyed to not "disturb" the goats. -Beyazit Church D is the remains of an 11th century church in the basement of Istanbul University's Science Department with a boiler to heat the faculty department in the middle of the church. -Remains at Acimusluk Street was part of a Byzantine palace in Istanbul and is now used to support an Inn above and is currently used to store soft drink crates. -Kalenderhane Mosque was a 12th century chapel and one of Byzantium's most important artifacts. Today it is a storage facility for the cleaners. -Karpos - Papylos / Menas Church was a 5th century church in Istanbul later turned monastery in the 10th century. Today it houses two shops - an iron workshop and a car wash shop. -Konstantinos Lips Church / Fenari Isa Mosque was a 10th century church in Istanbul and is now heavily destroyed by PVC coverings, electrical and water pipes. -Bogdan Palace is a really sad one. Part of a Byzantine church from the 13th century, today it is used as a tire repair shop (picture above). -Antiochos Palace and Euphemia Church was a 5th century palace and church dedicated to St. Euphemia whose relics today are stored in the Ecumenical Patriarchate. Due to heavy construction this place will soon be totally destroyed, along with its wall painting consisting of 14 scenes depicting the biography and the tortures experienced by Saint Euphemia from the 13th century, if preservation is not done soon. -Aya Sotiri Church has nothing remaining. Instead a flimsy concrete house sits on top of it and illegal excavations go on underneath the house by the residents. -Ayakapi Chapel dates to the 11th century, and in the apse where the priest used to celebrate the Divine Liturgy today is used as a timber shop. -Building at Merdivenköy was once a Byzantine monastery. Today it is a parking lot of an apartment complex built in 2005. -Theodoros / Tahtali Church is now a garbage dump. -Triada Chapel from the 14th century is just a mess. -Pendik Monastery was very imporatant in Byzantine times. Today it rests under apartment buildings. ISTANBUL - More than half of the Byzantine buildings in the Marmara region have been damaged, according to a report released yesterday by a volunteer group, the Archaeological Settlements of Turkey Project, or TAY. Istanbul, Satıcı added, more than 160 buildings from the Byzantine period have been exposed to damage. The TAY team has found 36 buildings or remnants in the area that were not detected before. The majority of the damage is done due to urban construction at the hands of the state, Satıcı said. The building of new settlements accounts for 33 percent of the damage while the construction of highways, roads and bridges creates 20 percent. Natural causes make up 19 percent, while secondary usage, such as using an old monastery as a sheep pen or a depot, causes 12 percent of the destruction. The TAY report shows how historic buildings or their remnants have become almost invisible as they have been used for other purposes or become seriously damaged. Boğdan Palace is one example. 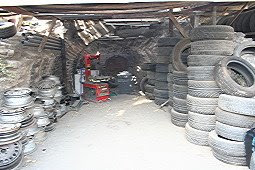 The entrance of the palace, which is part of a 13th-century Byzantine church located on Draman Street in the Faith district, is being used as a tire repair shop.